While Woodchuck Flooring appreciates all of our customers’ jobs, there is one type of customer we are sorry to hear from. It’s the discouraged customer who went with Johnny Hack-and-Pack, who didn’t take the time and care it takes to do a hardwood floor right. Our heart goes out to this customer, who spent their hard earned money on what they hoped would be a new, beautiful hardwood floor. And while we always deliver excellence in our floors; we make sure to go the extra mile for this customer in order to alleviate some of the frustration they faced when having their hardwood floors installed or refinished. 1. Do not let your contractor use your floor as a cutting board. If you are having your carpeting removed by your hardwood flooring contractor, make sure that when they are removing the carpet, they are not using the floor as a cutting board. When we remove carpeting from the floor, we roll back a three foot section of the carpet and then we cut it through the bottom of the carpet instead of cutting it from above. When you cut the carpet from above, you risk cutting into the wood floor. These cuts are difficult to sand out and could result in pieces of wood that will need to be replaced. 2. 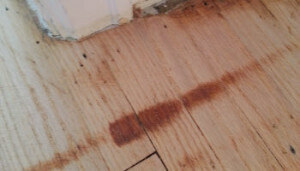 Do not let your contractor leave stop marks ingrained on your floor. When contractors begin sanding a floor, they will use a drummer or a large belt sander. These tools are great for working on the large area of the floor. When you get to the walls and corners, a edger is required to sand the floor. When you don’t use an edger, you see the stop marks from where the large belt sander was unable to reach. These marks will make your floor look sloppy and no good hardwood flooring contractor would allow these marks to remain on your floor. 3. Do not let your contractor skip the corners. This is probably the most common mistake we see from the Johnny Hack-and-Packs of the industry. 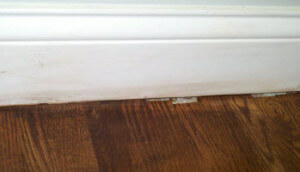 When a contractor skips the corners, you will see a swirl pattern, or sanding arches, left in the corner from the edger. The only way to properly sand these corners is by hand scraping the corner. In the before/after picture, you can see the work of a Johnny Hack-and-Pack hardwood flooring Minneapolis contractor and the work of Woodchuck Flooring. 4. 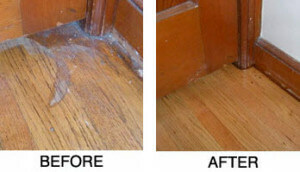 Do not let your contractor stain your trim. This is the job of a painter, not your flooring contractor. 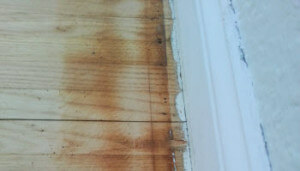 Stain on your trim just shows that your contractor is sloppy and lazy. When we apply stain near the baseboard trim, we use a fine, cut-in brush to apply stain. Then, in wiping stain, we use use a new, CLEAN cloth along the baseboard and perimeter of the room to ensure a spotless finish. While the mistakes above may seem like minor blips to other hardwood flooring contractors, we take pride in the small details of every project and guarantee that as a professional, you will never see these mistakes from a quality hardwood flooring contractor like Woodchuck Flooring.